Chateau / Country House3000 sq. ft.
3,000 SQ FT : 3 LEVELS ALL WITH BEAUTIFUL LAKE VIEWS. 50X20 SUN DECK OUTSIDE. BOOK NOW !! FOR MEMORIAL WEEKEND. BOOK NOW YOUR SUMMER FAMILY VACATION. WE ARE FILLING UP FAST FOR JULY AND AUGUST.........15% DISCOUNT FOR ONE WEEK STAYS...... SEE OUR 38 "FIVE STAR REVIEWS". PLUS : JUNE SPECIALS WITH EXTRA 15% OFF WEEKLY STAYS. PUT IN YOUR DATES AND THE DISCOUNT WILL BE SHOWN ON THE SUMMARY. HE OR SHE IS FAMILY !! RIGHT . #1 RANKED BY VRBO - HOME AWAY - VACATION RENTALS. "PREMIER PARTNER" . PLEASE SEE THE REVIEWS OF THIS LUXURY HOME. THREE PRIVATE SUITES, SAUNNA, CHEFS CUSTOM KTCHEN. BEAUTIFUL 50X20 SECOND FLOOR SUNDECK OVERLOOKING THE LAKE. FREE KAYAKS TO USE. A BEAUTIFUL NEW LAKEFRONT ESTATE HOUSE SET IN THE FINGER LAKES REGION AND THE ROLLING HILLS OF UPSTATE NEW YORK. CLOSE TO WINERIES, AND THE ALL NEW EMPIRE BREWING COMPANY AND FAMILY RESTAURANT, PARKS, TRAILS, HIKING, HORSE BACK RIDING. OR JUST LAY OUT AND RELAX ON OUR BEAUTIFUL SUN DECK OVERLOOKING THE WATER. TAKE A KAYAK TRIP DOWN THE LAKE. WE HAVE TWO JUST FOR YOU. BEST OF ALL " BRING YOUR DOG TO ENJOY THE FUN" WITH NO PET FEES !! VERY FEW OWNERS ACCEPT PETS ! THREE LEVEL 3,000 SQ FT LAKEFRONT ESTATE HOME SET IN ONE ACRE OF GARDENS. THREE PRIVATE SUITES SLEEPS EIGHT COMFORTABLY. ALL ROOMS HAVE FABULOUS LAKE VIEWS. 50X20 SECOND FLOOR SUNDECK TO RELAX BAR B Q AND SUNBATHE. ONLY 30 MINUTES FROM DOWNTOWN SYRACUSE, NEW DESTINY SHOPPING MALL , SYRACUSE, ( HANCOCK ) AIRPORT. MANY WATERFRONT RESTAURANTS, GOLF COURSES, WINERIES, PARKS, HIKING, BIKING, ALL JUST WITHIN A FEW MINUTES DRIVE FROM THE LAKE. THE ALL NEW EMPIRE BREWING COMPANY JUST 10 MINUTES AWAY. 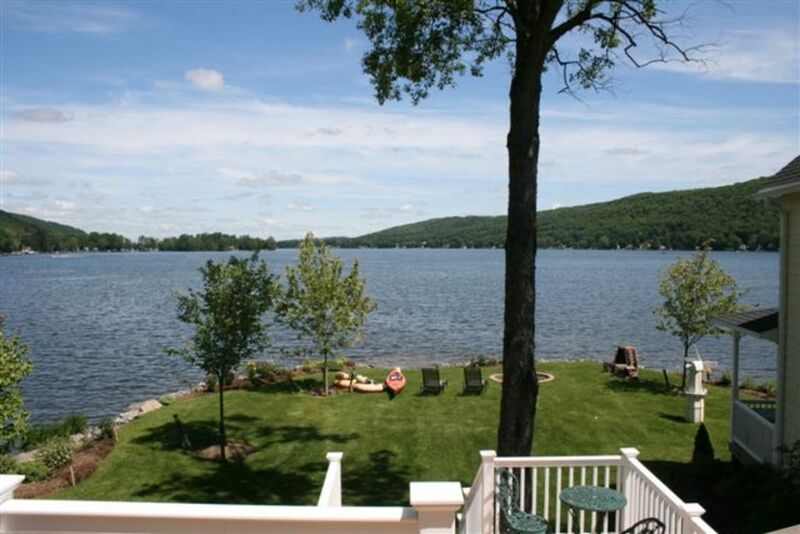 PLEASE SEE THE REVIEWS FROM FAMILIES THAT HAVE STAYED IN THIS BEAUTIFUL LAKEFRONT ESTATE. SECOND FLOOR : MAIN LIVING LEVEL : CHEFS OPEN PLAN KITCHEN WITH COMMERCIAL GRADE APPLIANCES AND GRANITE COUNTERS. TASTEFULLY FURNISHED LOUNGE WITH FIREPLACE. ARCHWAY TO DINING AREA AND SEATING FOR SIX. FLAT SCREEN TV AND HI-FI STEREO SYSTEM. FOUR SETS OF FRENCH DOORS OPEN ONTO "FABULOUS 50X20 PRIVATE SUN DECK" WITH STUNNING VIEWS OF THE ENTIRE LAKE. THIS AREA HAS TWO SUN LOUNGERS, ROCKING CHAIRS, DINING TABLE WITH BENCH SEATS. GAS BAR B Q. SECOND FLOOR MASTER SUITE : KING CANOPY BED. BEAUTIFUL LAKE VIEWS WITH DOORS TO SUN DECK. PRIVATE BATHROOM WITH SHOWER AND PRIVATE READING ROOM. THIRD FLOOR : 2ND PRIVATE SUITE WITH KING BED AND FUTON BED IDEAL FOR KIDS. DOORS TO PRIVATE BALCONY WITH STUNNING LAKE VIEWS. PERFECT FOR EARLY MORNING COFFEE AND ENJOY THE VIEW. PRIVATE BATHROOM WITH SHOWER/TUB COMBINATION. PRIVATE SAUNA OFF HALLWAY. GROUND FLOOR PRIVATE SUITE : LOUNGE AND SEPARATE BEDROOM WITH QUEEN BED. PRIVATE BATHROOM WITH SHOWER. SLIDING DOORS TO PATIO AND MAIN LAWN. PLEASE NOTE:THE RENTAL PROPERTY NOT AVAILABLE FOR PARTY SITUATIONS OR " LARGER GATHERINGS " AT ANY TIME DURING THE RENTAL PERIOD. THE HOME IS ONLY AVAILABLE FOR ADULTS AND CHILDREN OR ADULT COUPLES, 8 PEOPLE MAX TOTAL, LISTED ON THE RENTAL AGREEMENT, AND SEEKING A LUXURIOUS AND RELAXING VACATION. This beautiful Direct Lakefront Estate was built in two Phases. The Three Level Main House was built in 2008/9 and the Guest House was completed in 2013, and is a smaller version of the Main House with the same high quality furnishings throughout. The One Acre Peninsular has complete privacy and is an ideal location for a wonderful vacation experience. The Estate Home has a Total of 3000 to spread out, relax and enjoy. There is a private Sauna, Jacuzzi and reading room to relax in. All Rooms have commanding views of the lake. Please see the " Reviews " on our Home Page. These are Genuine Reviews form Guests and Families that have had a wonderful experience here at " Chateau D'Amore". toilet, shower, PRIVATE ENSUITE BATHROOM WITH READING ROOM. Radiant In Floor Heating & Gas Log Fire in the Lounge. Step Master in third floor suite . Sauna on third floor. LOUNGE has 42' flat-screen Television. Two Bedrooms have smaller tv sets. Two kayaks for complimentary use by our guests. The area is a 'Winter Wonderland' for Ski and Snow Mobile enthusiasts. Toggenberg Ski Resort is 10 mins. away Labrador Resort 20 mins. and Greek Peek Mountain Resort 30 mins. Snow trails all around. Would definitely book another stay!! The house was as advertised, spacious and impeccably clean. Having coffee looking out over the peaceful and serene lake was memorable. The owners couldn't have been nicer or more accommodating to us. An overall enjoyable stay and we will book again when in the area!! A relaxing home away from home with views you don't get a home! Beautiful private home on a well kept, magnificent lake. Views of the lake from kitchen/ living room as well as master and upstairs bedrooms. Thoroughly enjoyed making meals while looking out onto the lake. Just need to bring your food and drink!! Owners even provided bagged ice! Looking forward to come back in the future! We were pleased to stay here for a long holiday weekend. A beautiful spot with attentive owners made this a wonderful retreat. Four generations agreed that we would choose this lovely home for another visit. The kitchen provided all the needed equipment and space, the bedrooms were comfortable and private, and the deck and outdoor areas were large and well appointed. Thank you for sharing this wonderful property! We are so pleased you all had a nice family vacation. There must have been plenty of fun for the kids if they could not find their I-Pads !!! Please come back again to the Lake House !! Dave and Rhonda are wonderful .Dave answered our text any time we had a question Plenty of room in their home for my husband and I and my son his wife and four children . Front lawn great for frisbee,badminton ,ball and even kite flying . My grandkids had a great time in front playing and back yard swimming and fishing . Lake is great for children because it’s not so deep . House has plenty of cookware even a waffle maker ,just needs some plastic bowls for outside eating .Fire pit great for marshmallow roasting and propane grill for grilling every night . My grandchildren even learned a little how to kayak . Very beautiful view,quiet ,peaceful and restful week was had by all.This is a great house to rent - plenty of room for the dogs too who had fun running around . The interior of the home is country modern, spacious and pleasantly decorated. The visual of waking up to the beautiful DeRuyter lake is breathtaking. My husband and I thoroughly enjoyed the serenity and sitting on the deck while drinking a cup of coffee first thing in the morning. The sunset was equally appealing and the layout and amenities of the house were very comforting. As a bonus, the hosts were very informative and pleasantly welcoming as well as the community residents... Additionally, the fishing was great! It was our pleasure welcoming you and your husband to our lake home. Many of our guests really enjoy the peace and serenity of early mornings with coffee on the Sun Deck with only nature to listen to. We are so pleased you had a nice relaxing break from your very busy public life. Please come back again !! David and Rhonda and Alessandro. PLEASE NOTE : THE LAKE ESTATE HOME IS NOT AVAILABLE FOR PARTY SITUATIONS OR " LARGER GATHERINGS " AT ANY TIME DURING THE RENTAL PERIOD. THE HOME IS ONLY AVAILABLE TO FAMILIES AND CHILDREN OR ADULT COUPLES SEEKING A LUXURIOUS AND PRIVATE VACATION AND LISTED ON THE RENTAL AGREEMENT.